For all multi-sites, appointment types can now be departmentalized, allowing each department to set different properties (color, duration etc.) for their appointment types. 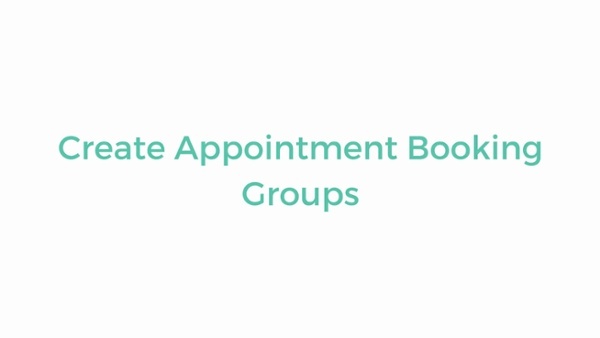 Appointment Booking Groups are a new tool that allows you to group your appointment types together (similar to product groups). You may want to group your departmentalized appointment types under a particular booking group for easier reporting. For example, you can have an Appointment Booking Group called Consult, and then have a consult appointment type for each of your departments with different properties. This also means that you will only see the appointment types applicable to the resource chosen. When it comes to reporting on your appointments, you can then choose to report based on your Appointment Booking Group. Please note, there are permissions associated with Appointment Booking Groups. For more information on appointment groups and appointment booking groups, click here. A new feature in the clinical record allows you to insert the patient’s Previous History into a new sub-record (i.e. if you are creating a new History, you can insert any of the patient’s previous History records). Select from a drop-down of previous records and insert it to use as a base for the current medical note - the most recent records will be listed at the top. You can also hover your mouse over each record listed to show a preview of the record note before inserting it. The Print Combined Invoice report is now accessible from the contact financials tab - select any or all invoices (or don’t select any to print all) and under the financials, there is a button to 'Print Combined'. This report has also been improved with additional columns such as 'invoice date', 'invoice number', 'patient' and 'client' (client name only visible when printing from the REPORTING tab and no client has been selected). When setting up commission (for a user or a role), you can now differentiate the discount percentage for dispense fees. This gives you more control if you pay different commission amounts depending on the product versus the dispensing fee. To create Automatic Clearing House (ACH) payments you will need the PayJunction API integration. You can now select which default terminal/account to use, per user. At the top right-hand side of your screen, select the Payment Integration Settings icon. Your ACH terminal is linked to your Default PayJunction API. So, if you have more than one PayJunction API integration, changing this will also change your options for your ACH terminal. You will need to have a Default PayJunction ACH Terminal set to create any ACH payments. Under Admin > Users/Resources > Users, there are two new filters in the search tab to see all local users and all head office users. Note: A user is recognized as a Head Office User if the Head Office User check-box is enabled under User Settings. When you ‘add/remove department’ from templates using the Records dashboard, you can now specify more than one department at a time with the little green plus icon. When you Copy Divisional Pricing of products using the Records dashboard, you can now specify more than one department at a time to copy to, with the little green plus icon. Additional tabs to centralized inheritance include Tagging Tasks, Price Adjustment Rules & Automated Reporting. ‘Add + Dispense’ and ‘Add + Request Dispense’ added to the RVM Prescriptions tab. If you’re an existing ezyVet customer and would like to enrich your ezyVet knowledge, reserve a seat at our next live webinar series, hosted by our product experts.